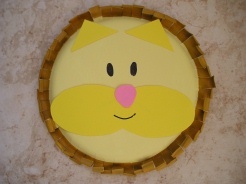 This adorable paper plate lion is a great, inexpensive Lion craft for kids! 1. Paint the paper plate yellow in the center, and for the lion's mane, mix brown and yellow paint together and paint around the outside rim of the plate. 2. Once the paint is dry, cut 1" slits around the outside rim of the paper plate. Curl around your finger or a pencil to make the mane. 3. Using the yellow paper, cut out 2 ovals (around 4-5" long)and a square measuring about 2"x2". Cut the square in half diagnoally to make 2 triangular ears. Using the pink paper, cut out a nose. Glue all of these parts onto the plate. Don't forget to draw on the eyes and mouth. Great Job!